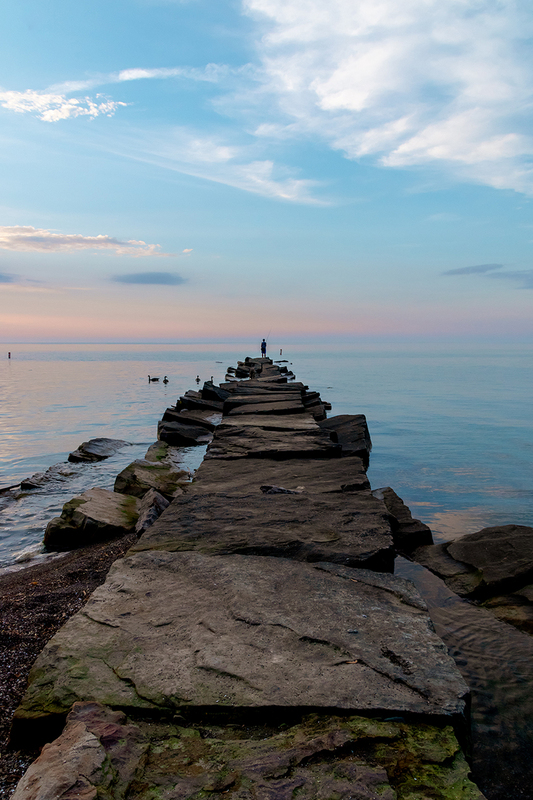 This photo at the jetty was taken on Lake Erie, at Huntington Beach in Bay Village, Ohio. I always see the best sunsets at this beach. This was over the summer, and it was nearly 100 degrees that day, so there was a foggy mist hanging in the air. I don’t usually put people in my landscape and nature photos, but one of my sons was standing out on the end of the jetty checking out the geese. I thought having him in the photo added a sense of scale and showed how vast Lake Erie is. 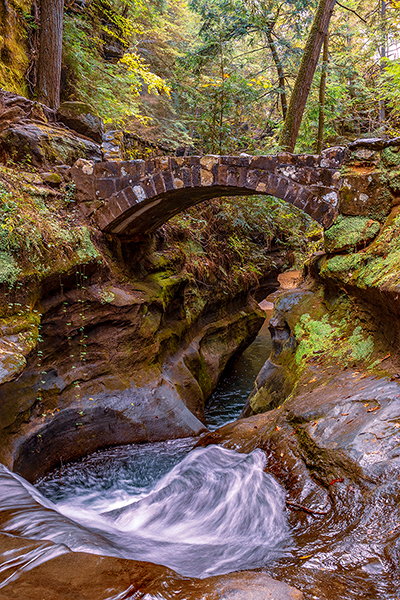 In Hocking Hills State Park lies Old Man’s Cave, one of the most popular hiking areas in the park. The cave was so named because a hermit actually used to live there in the early 19th century. The swirling pool you see at the bottom of the frame is called Devil’s Bathtub: The top part of the waterfall drops down into it, where it swirls around until it drops into the larger pool below. This was a photo I had to shoot handheld, because it was terribly slippery there. I was petrified I’d drop my camera into the water—I’ve fallen before in that spot! I took three different shots to stack the image just in case I had any kind of shake or the clarity wasn’t as good as I wanted it, but thanks to the 18-200’s Vibration Compensation, the image turned out great. 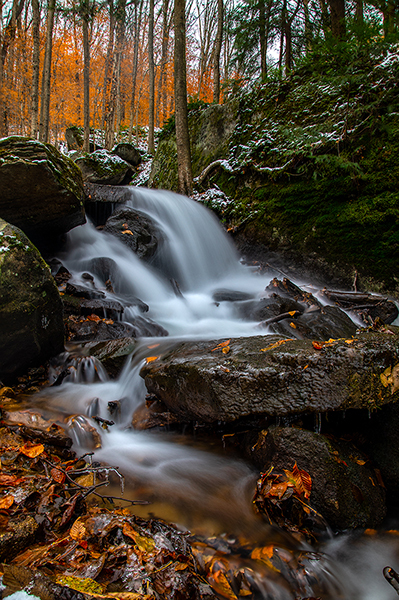 I often take pictures at Boch Hollow State Nature Preserve, which is where I’ve been practicing many of my waterfall shots. You need a permit, though, to access the off-trail areas. For that reason, I couldn’t get that close to this waterfall, so I had to take advantage of the zoom on the 18-200 to get as many different perspectives as possible. 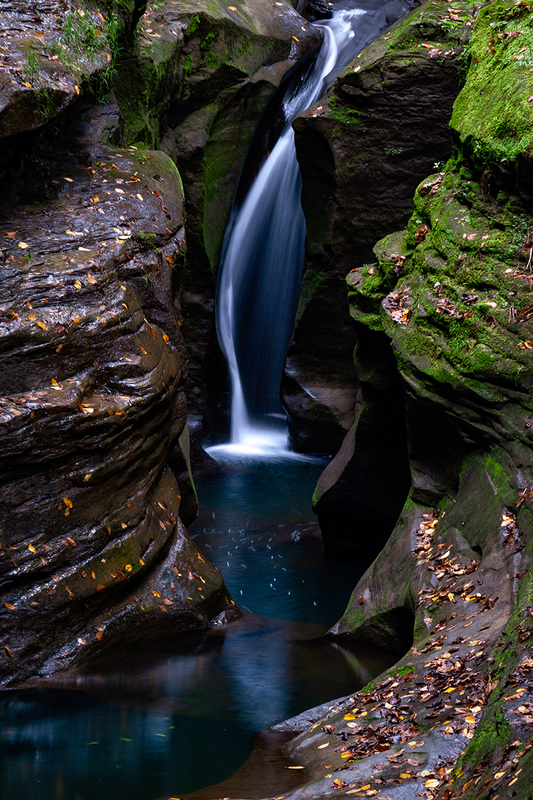 I think I came home with more than 100 photos of the waterfall, using all different focal lengths and POVs. My experience here also speaks to the durability of this lens: It was cold and wet that morning, and my lens kept getting moisture on it. I even dropped the lens at one point and it rolled down the hill. It performed as if nothing had even happened. This is Bent Run Waterfalls, in the Allegheny Mountains across from Kinzua Dam. My husband had been there dirt biking many times on this remote path and told me about the falls. What’s amazing about it is that it’s not just one waterfall: It has many different layers, stretching up and turning into several smaller waterfalls. It was really cold that day, and I wanted to capture that feeling by showing the leaves coated with ice in the foreground. I took this waterfall photo on a tripod so I could minimize camera shake as I slowed down my shutter speed as much as possible to capture that creamy, silky effect in the water. In this case, I wasn’t able to stack the photos—it would’ve given the image a weird, ghostlike effect—but the 18-200 was able to offer me the sharpness I was looking for without me having to create all of those layers. We were out over the summer looking for property when I spotted this abandoned farm just sitting in the middle of the field. 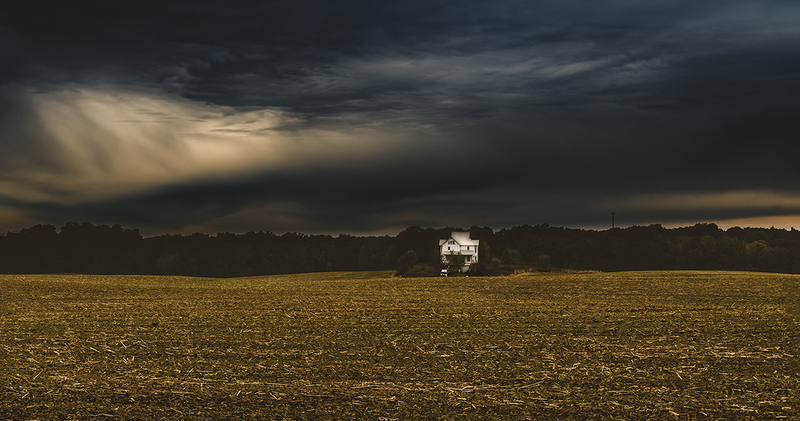 A storm was passing overhead, and in combination with the abandoned farmhouse, it gave the whole scene a somewhat eerie feeling. As we were driving around that day, I had seen that the sun kept trying to break through the clouds, and right as we got to this farmhouse, they did. Some people who saw my image later on said I maybe should’ve cropped it so you can see the house more, but that’s not the effect I was going for. I threw out the rule of thirds and placed it just off-center, so you can see the expanse of field around it and that dramatic sky. There’s a park I go to near me probably five times a week, and I almost never pay attention to how the road looks. 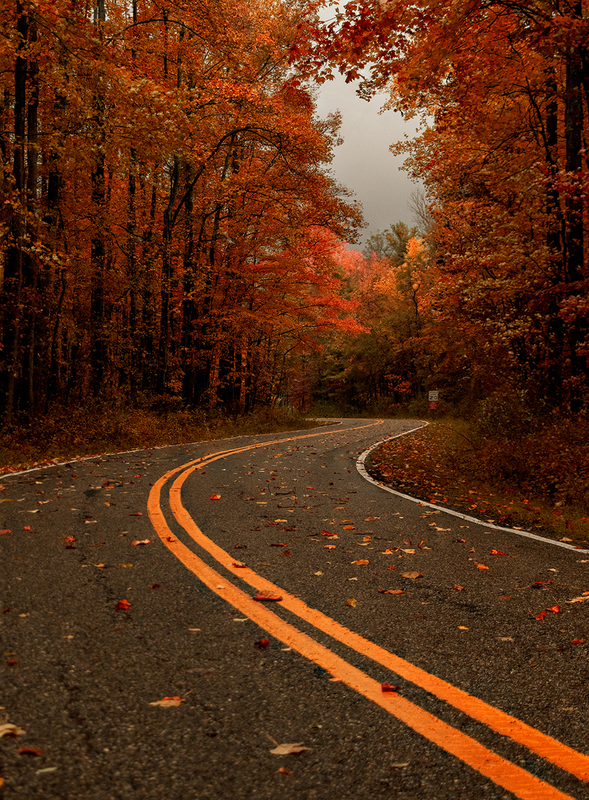 This time, though, the curve of the road caught my eye. I got a sense of someone not really sure where they were going or how things were going to end up. Once again, there was a storm brewing in the background, as you can tell from the darkening sky, which made those orange leaves really pop. In retrospect, the only thing I wish I’d done is take the street sign out, though it’s not terribly noticeable. 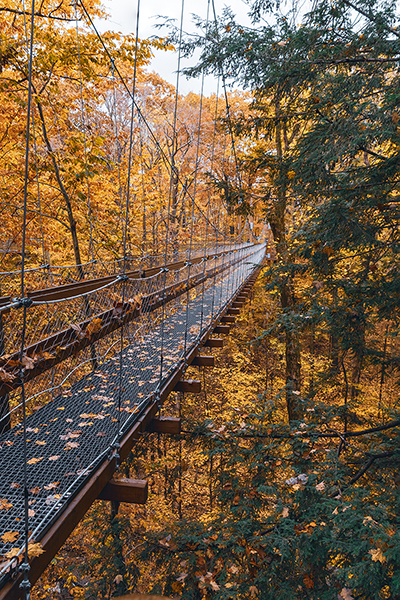 At Holden Arboretum, a 3,500-acre outdoor “living museum” in Kirtland, Ohio, is the Murch Canopy Walk, an elevated walkway that stretches more than 500 feet and hovers 65 feet above the forest. The walkway actually sways as you walk on it. What’s funny is that I had a fear of heights before I started taking pictures, but now, as long as I have the camera stuck on my face, heights don’t bother me. I had first spotted this scene in the summer and knew I had to come back in the fall to capture the foliage. I took this photo handheld, but I couldn’t stack the photos in this case because the leaves kept moving, and people kept walking back and forth into my frame. I didn’t even have a lot of time for setup on this image, but it ended up becoming one of my favorite photos ever. The photo is also a testament to the 18-200 and how it renders colors. This photo needed barely any touching up in post-processing—the colors were basically as vivid as you’re seeing them here.